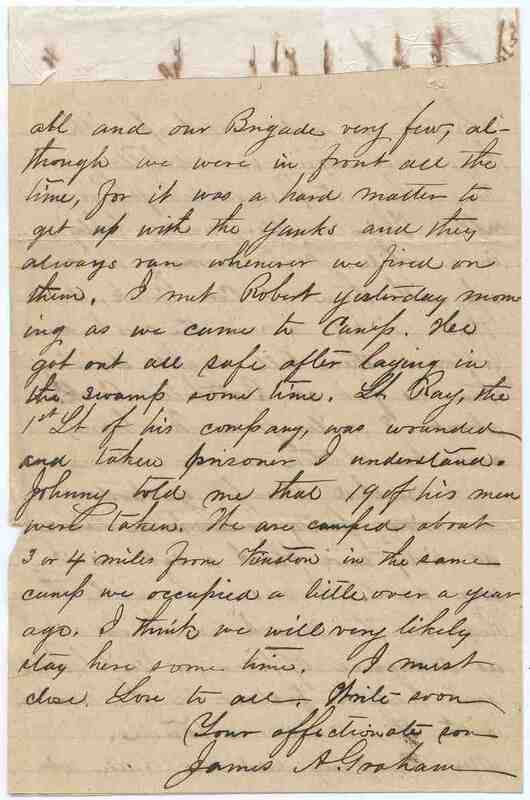 Item description: Letter, dated 26 May 1863, from James A. Graham to his mother. He discusses troop movements and skirmishes with Union troops in the coastal North Carolina area around Kinston and New Bern. Item citation: from folder 2 in the James Augustus Graham Papers, Southern Historical Collection, Wilson Library, University of North Carolina at Chapel Hill. We have just returned from a trip after the Yankees. 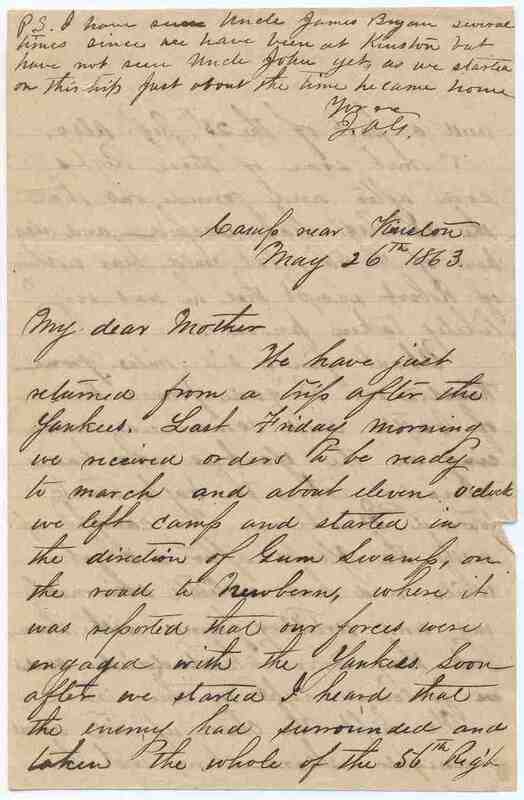 Last Friday morning we received orders to be ready to march and about eleven o’clock we left camp and started in the direction of Gum Swamp, on the road to Newbern, where it was reported that our forces were engaged with the Yankees. Soon after we started I heard that the enemy had surrounded and taken the whole of the 56th Reg’t and a part of the 25th Reg’t also. I met some of those Reg’t soon after and found out that the 25th Reg’t had escaped and also part of the 56th, but could hear nothing of Robert except that he was very likely taken prisoner. About five or six miles from Kinston our Brigade formed line of battle and commenced advan-cing on the Yankees who had already taken the back track toward Newbern. We caught up with the Yanks after a short while and had a little skirmish-ing and artillery firing with them, but they soon skedaddled and we followed right on their track. 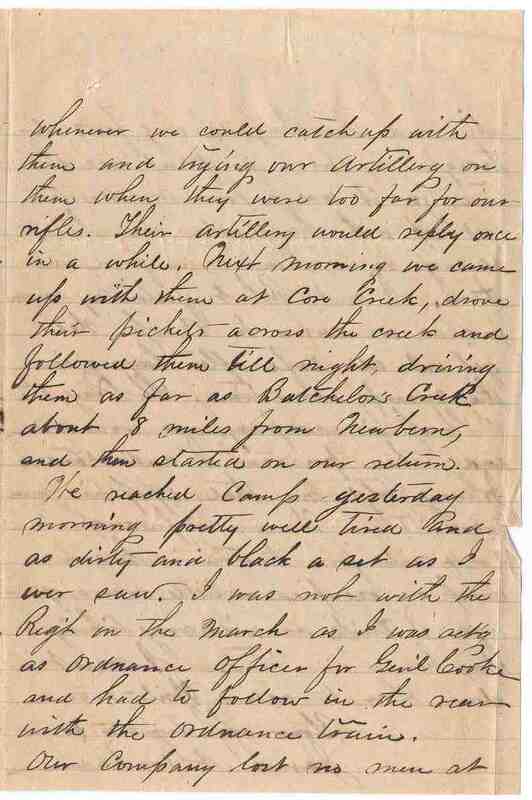 We kept the chase up till about midnight skirmishing with them whenever we could catch up with them and trying out artillery on them when they were too far for our rifles. Their artillery would reply once in a while. Next morning we came up with them at Core Creek, drove their pickets across the creek and followed them till night, driving then as far as Batchelor’s Creek about 8 miles from Newbern, and then started on our return. We reached Camp yesterday morning pretty well tired and as dirty and black a set as I ever saw. I was almost not with the Reg’t on the march as I was act’g as ordnance officer for Gen’l Cook and had to follow in the rear with the ordnance train. P.S. I have seen Uncle James Bryan several times since we have been at Kinston but have not seen Uncle John yet, as we started on this trip just about the time he came home. More about this item: James Augustus Graham was a resident of Hillsborough, N.C., and an officer in Company G (Orange Guards), 27th North Carolina Infantry Regiment, Confederate States of America. 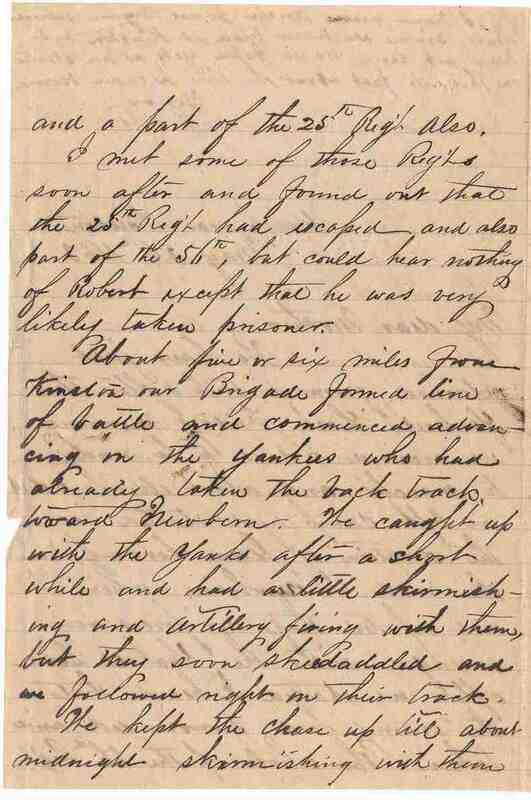 This entry was posted in Southern Historical Collection and tagged 25th North Carolina Infantry Regiment, 56th North Carolina Infantry Regiment, Bachelor's Creek, coastal areas, coastal defenses, Core Creek, General Cook, James Augustus Graham, Kinston, New Bern, North Carolina, troop mobilization. Bookmark the permalink.